I'm getting into kite building. I was wondering if anyone has done a colored leading edge? If so, what material did you use? Dacron is available in every color. I've only seen a few which I liked. For example a all white kite with white leading edges. But luckily everyone has got different taste, so good luck. But I will stay with black (maybe I will use grey sometime). do you know a good supply place to get some? I've done a few using Red back when Flymarket had a supply of that color.. I am very pleased with the results.. I use white all the time. Really gives a nice contrast when flying low to the ground. 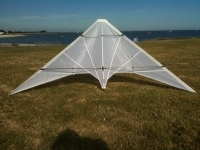 I prefer White over black simply because it sets my kites apart from the typical. You can also see though the white to deal with the spars enclosed within. those are cool!! Thanks! I may have to do that!! In the "old days" there were several kite makers who rolled the sail material into a spar pocket, so it was exactly the same as the rest of the kite. 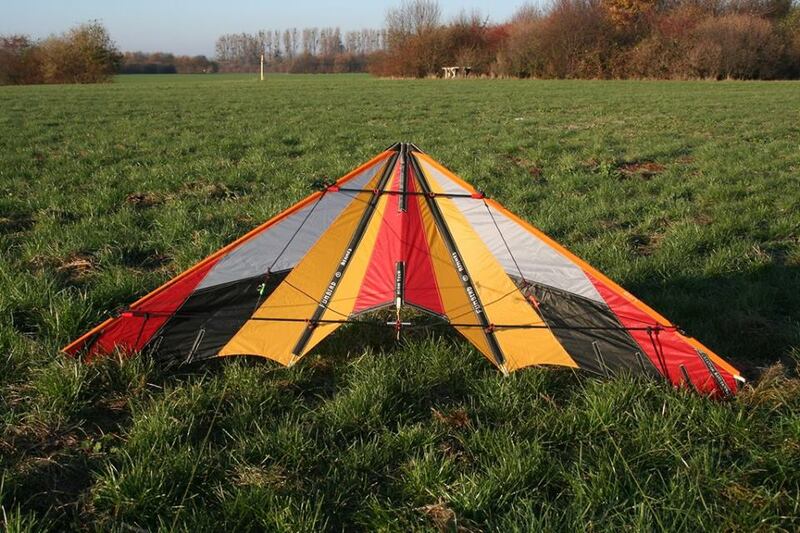 Search pictures of Peter Betancourt kites. John Chilese has many good pictures. we've used that assembly process (rolled over sail for the leading edge) w/"no sew" sport kite projects made entirely of a single skin of icarex, you have to reinforce specific areas with grosgrain or Dacron patches BEFORE finishing and I highly recommend 3M's 9460 VHB adhesive too. It doesn't have to be "craft ironed", simply weighted-down overnight is sufficient. Flown quads built this way for 3,000 hrs, the fabric directly next to the seam fails eventually, but never the taped bond! Here one of the 6 North Shore Radical full white limited serie built by Patricia Tabor. Cool! Thanks for the pictures and the info. As I get more into building I'll try some different techniques out! P.S. More input is always good. Keep it coming! Yellow or orange Leading Edges are not so ugly IMHO. That is one eye-popping NSR. With upgraded or more modern fittings, as well. Count me in on these looking nice with the colored LE! !